The Philadelphia 76ers will take on the Charlotte Hornets on Friday night in the NBA. The Sixers (7-5, 6-0 home) have not been as good as advertised so far this season, and actually look worse than last year despite the fact that their two young superstars, Embiid and Simmons, were supposed to improve. 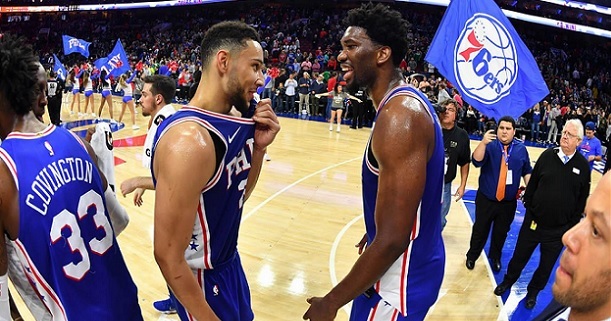 Those two are playing well, but Philly lost some shooters in the off season and right now the team does not provide enough support for Simmons and Embiid. Still, a 7-5 record is not a disaster. Philly also won 5 of the last 7, and is undefeated at home. The Hornets (6-5, 2-3 away) are set to be yet again a mediocre team fighting to make the playoffs. Charlotte missed the postseason last year and isn`t playing much better this season either. Charlotte will be happy with its winning record so far, but that could change soon as their schedule will get more difficult in the next few games. The Hornets are coming after two convincing home wins against two of the worst teams in the league, Cavs and Hawks. Bet on Sixers v Hornets and get your 100% (120 Eur) welcome bonus at LSbet now! Team news: The Sixers will continue to miss Smith, Bayless and Muscala, all backup players. The Hornets have a clean bill of health ahead of this match. While the Sixers have not been at their best so far this season, they are showing some improvement lately, and are definitely a better team than the Hornets. More importantly, the Sixers have been strong at home, posting a 6-0 record this season. On the same note Charlotte is not a good road team (15-26 on the road last season, 2-3 this season with 3 losses in a row). The two teams actually met two weeks ago at the same venue with Philly grabbing a narrow 105 – 103 victory. While the score was (too) close, the Sixers actually were playing worse back then, and had a bad game overall. They are likely to be better this time around. All in all there`s a gap in class between Philly and Charlotte, and even though Philly is not playing lights out, Charlotte is not playing better either. Home court advantage will be very important and you have to feel that Charlote doesn`t look like the team to hand Philly its first home loss of the season. Look for the Sixers to outrebound the Hornets and shoot more free throws, just like in the previous meeting, and as long as they don`t have a horrible shooting night and / or turn the ball over excessively, they should be fine. My tip will be Philly to win straight up, I wouldn`t have priced them above 1.35 here. I`ll avoid the handicap for extra safety considering that both teams have been involved in some close games this season, including against each other. Prediction: Philadelphia 76ers – Charlotte Hornets 116 – 106. Given the fact that u cant play much defense these day ( if u really play defense, u will get yourself out of the game), Thats make the result much more random. Betting on these low odds may not be a good strategy. eg: GSW is not bad last night, but Bucks shots just went in and GSW shots didnt. I disagree, I think that`s a bit of a superficial view. For every action there is a reaction, we must adapt to the new NBA. There will always be value, and value can be found even on 1.05 odds. The biggest value bet I ever saw had 1.20 odds (Mayweather vs McGregor)..
Maybe i am not a nba expert. But i watch the game this season, i just feel it is more random than the old day. If the ball dont drop for u, It is difficult to rely on defense to win game. U just have to find a way to get hot. Overall, you are not wrong. You bet on a team and it`s going well, then the other team starts hitting 3`s like crazy and there`s nothing you can do. But we just have to find a way to adapt. If you find it so unpredictable, maybe you can go to the under / over market. Or other markets. I`m still comfortable handicapping the games, but there are plenty of other markets to bet on. And don`t forget that unpredictability actually creates opportunity. yes, unpredictability actually creates opportunity, but on things that re less expected.